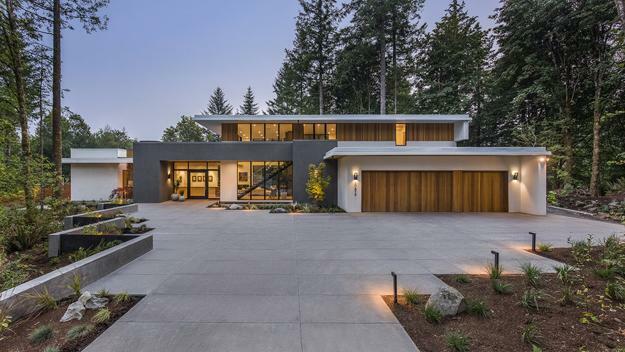 Wildwood House by Giulietti Schouten Architects offers spacious and bright home interiors enhanced by gorgeous views of the surrounding forest. Concrete slabs blend with rocks, wooden architectural designs harmoniously mix with mature trees seen from every room in this modern house. 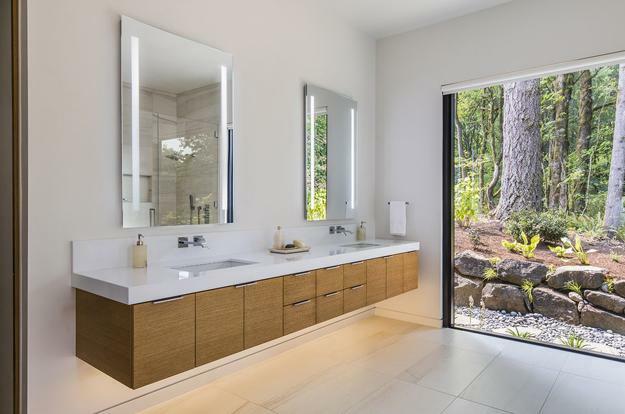 Located in Portland, Oregon, the contemporary home is a beautiful rural retreat built on the picturesque site in the forest. 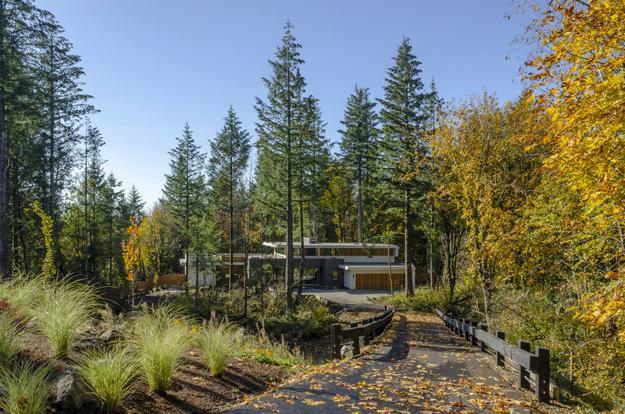 The modern house is a primary residence hidden among mature trees in the Pacific Northwest. 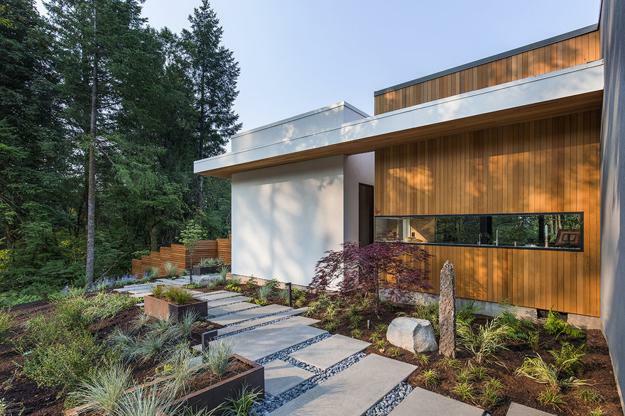 The house design features simple, clean lines and natural exterior and interior materials which organically fit within the forested 1.2-acre site. 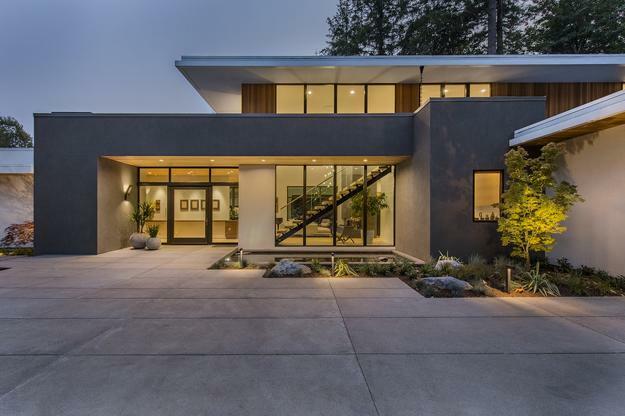 The architectural elements and modern interiors connected with the surroundings embrace outdoor living throughout the year. This warm and comfortable house design is perfect for the cool northwest climate. 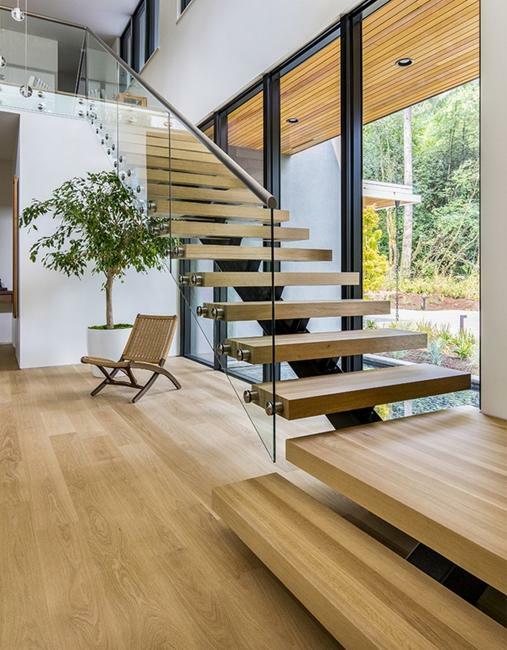 Large windows infuse the modern home interiors with natural daylight and provide beautiful views of the forest. The house design features an extended, single-loaded, open plan living areas which are functional and bright. 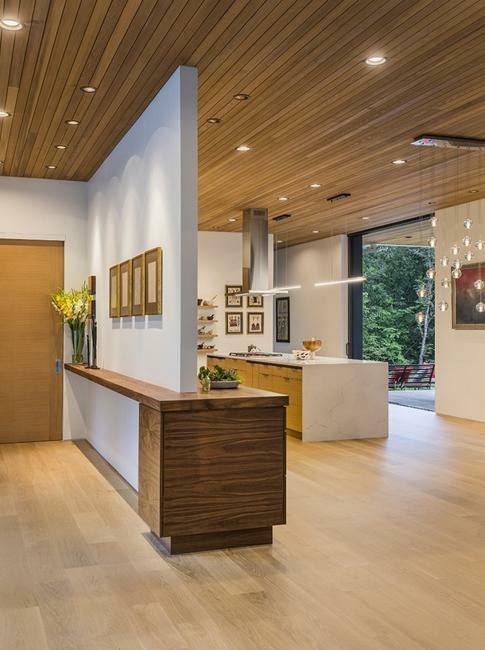 Wooden walls and ceiling designs add coziness and comfort to modern interiors enhanced by the spaciousness and white decorating ideas. 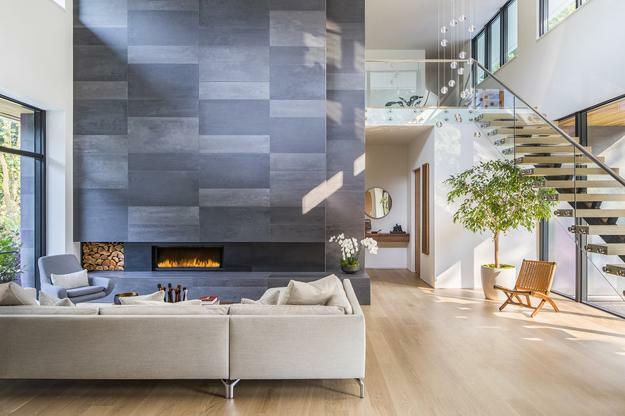 A two-story central hearth is a dramatic feature. The fireplace design marks the division between the large living room and the private master suite. Large windows invite plenty of daylight and show a play of sun rays on the fireplace tiles. A quiet space at the south provides a separate retreat from the living area. 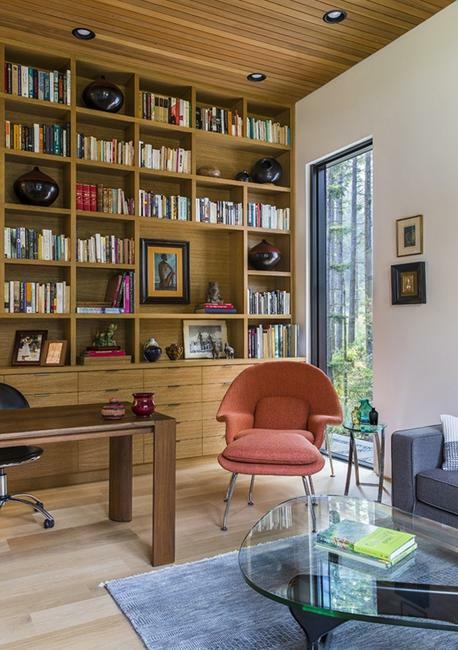 Built-in shelves offer plenty of storage for books and create a cozy place for reading. The decorative wall defines the contemporary kitchen design with a spectacular island. 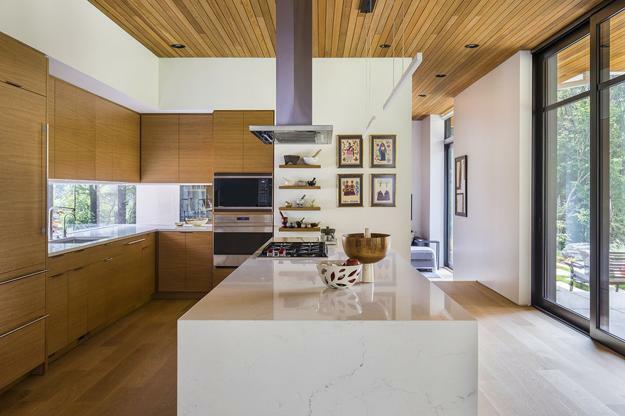 Wood ceiling and large windows help merge the kitchen and dining areas which the forest. 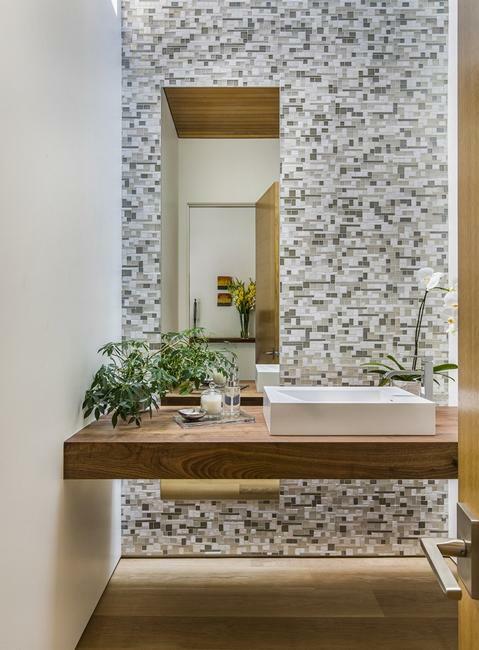 Wall-to-wall windows, a contemporary freestanding tub, and a glass shower design complete beautiful, modern bathroom.